Sure you can relate to all of them. Age and Experience – Think of yourself as you were at age 25 or younger. As we progress through our lives, we take on and learn coping strategies from those around us. We are sort of like a giant snowball rolling downhill picking up more and more snow, and yet that core in the very center (which is still you) hasn’t changed. It can be hard to sort out what your own original strategies are unless you place yourself at the age before this process got under way. If you are 25 or younger this is a breeze, but for many, it’s kind of a stretch. This is the age that most people really take their original coping strategies “on the road,” and the “cross-contamination” that can confuse the assessment usually begins. Motivation not Behavior – Don’t focus on what you do. Focus on why you do it. The real magic of the Enneagram is how it addresses who you are on a much deeper level than defining yourself by what you do. You and I could do the exact same thing for completely different reasons, thus the behavior itself doesn’t tell us nearly as much . We'll keep the 3 Rules in sight over in the column to the left, for extra clarity. Aiming to offer quick, abbreviated descriptions, for quick reference only, the descriptions will err on the side of generalities and traits from different levels of development within the same type. You won't fit all of the description to a tee, but you'll notice when it pretty much has you pegged. Remember, this stage is where you need to apply the "3 Rules" Each Type has a distinct shift in perspective when life becomes more stressful, or when you feel more secure or confident. If the description is accurate for your average state, but totally wrong for your stressful state, that disqualifies the Type. The same rule goes for how you feel when you're totally confident and secure. This process effectively "triangulates" your position, just like when you give someone an address, and give them the two streets the address is between. Even if that address could be found elsewhere, only the one between those streets is the correct one. 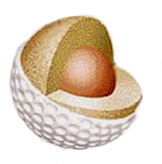 When you think about how this system describes you, it may be helpful to think about the layers of a golf ball. At the core is your true self (how you absorb and sort information and stimuli.) The rubber bands that wrap around that core are like your personality, values and so forth. They form fit around and take on the shape of that internal core. Finally, the hard outer surface is what the rest of the world sees and interacts with. Another way to think about this is as a choir of voices or a Board of Directors within you. I'll include these voices with each description, as their familiarity may be quite helpful in identifying your own Type, or recognizing others in your life. Core One: It can be better, improved; and should be. 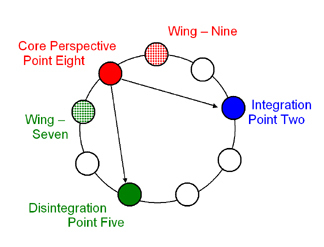 Nine Wing: Can’t we all just get along and not have to do anything? Two Wing: How can I help you? Integration Point Seven: Let’s experience everything enthusiastically! Disintegration Point Four: Dark, bleak emotions are drowning me. Being drawn to the confident perspective of your brain, you lean toward a rational, yet idealistic approach, with a deeply felt sense of responsibility, and you’re attracted to the orderly and highly principled. You have an intuitive ability to see potential for improvement, noticing what is right or wrong, and you are strongly motivated to improve it. You may often get frustrated by people "breaking the rules," or "doing it wrong." Your sense of "rightness" is influenced by your wings of "why can't we all just get along?" and "helping people is the right thing to do." You are responsible and dependable, priding yourself on your honesty, integrity, and work ethic. Focus of Attention: What’s wrong and how it can be improved. The Dark Side: Your attention to "things being wrong" can lead to a compulsive need for criticism, judgment and "correcting" of yourself and others. Sometimes this sounds like a "running commentary" to those around you. It can be hard to see when something is good enough. With a tendency to engage in black and white thinking: relationships, tasks, even life are judged either good or bad, right or wrong, fair or unfair. You often take on too much responsibility and then may feel resentful that others don't do their share or come through with their commitments. Forsaking pleasure in favor of what "should" be done adds fuel to the fire of resentment that burns inside. Fear of making mistakes or appearing foolish can lead to procrastination in decision-making, as shame is high on your list of things to avoid. When Stressed Out: Suppressing your anger about things being wrong, and not being able to change them, pushes you to feel much more emotional, melancholy, even depressed, as well as less connected to your intuition. You feel the pull to withdraw from others in your moodiness. When Relaxed and Secure: You feel more adventurous and want to try all sorts of different things. Rules don’t feel as imperative, especially when they limit your fun. The black and white thinking goes Technicolor. You can read on about the rest of the Types, or ask yourself: "Okay, now that I know my Type, what's in it for me?" Core Two: How can I help you? One Wing: It can be better, improved; and should be. Three Wing: I can just do it. Integration Point Four: Grace and beauty are everything. Disintegration Point Eight: My way or the highway. With a caring, nurturing, giving nature and a drive for connection, you have a natural ability to "read" others empathically, and a desire to fill their needs, while postponing your own. Your desire to help others is influenced by your wings of "rightness" and "I am what I do." Focus of Attention: Other people’s needs and feelings, connecting and approval. You feel driven to connect emotionally and fill others’ needs. You enjoy facilitating and enthusiastically supporting others in reaching their potential, and prefer being the power behind the throne. At your best, a warm and caring true altruist, where giving is as natural as breathing, and free of expectation. The Dark Side: You are often so tuned into other's needs/ feelings that you’re not aware of your own. As a result, you can find yourself drained, resentful, and even angry (usually showing up as passive-aggressive behavior, so as to not alienate anyone and get disconnected). You may give to get, and at times may give to those who’ve not asked for help or don't want what you offer. Feeling you know what others really need and that you can provide it can be a source of pride. When Stressed Out: You feel like you need to take charge and make sure everything is taken care of. Sometimes it shows up as a flash of anger, feeling taken advantage of or not listened to. When Relaxed and Secure: You feel like you can just immerse yourself in your emotions and feel everything more deeply. Crying from happiness or witnessing "grace," comes as easily as from pain or sorrow. Core Three: I can just do it. Four Wing: Why do they have it better? Where’s the beauty and the art? 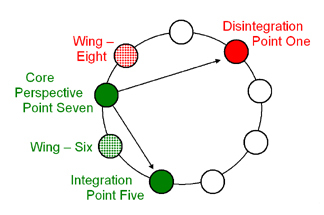 Integration Point Six: Contingency planning and teamwork. 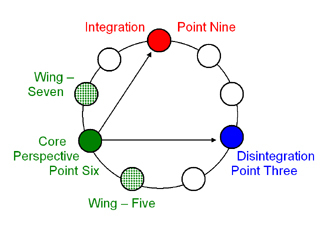 Disintegration Point Nine: Can’t we all just get along and not have to do anything? Having a can-do, adaptable, competitive and ambitious nature, you like to get things done, as you identify your sense of self with your accomplishments. You feel impatience with anything preventing those accomplishments. Focus of Attention: Success, the goal-oriented task at hand, and coming out looking good. A multitasking, high-energy person, you get things done. A clear goal and clear expectations is all you need to feel ready to take on the world. You can adapt to any situation or group with a chameleon-like ability to match the environment. You can inspire and motivate through charm and presentation of a successful image; a natural salesperson. The Dark Side: Focused attention on goals and tasks can overshadow other parts of your life. Feelings can be stuffed in the service of doing. An underlying "win at all costs" driver within may increase your feeling of competition, and invite cutting corners to complete goals or projects, in a "just do it" manner. When Stressed Out: You may start to feel disengaged, vague, unfocused, drained, tired, and un-prioritized, and want to avoid things. When Relaxed and Secure: You feel less competitive and more cooperative, with more satisfaction and joy coming from team accomplishments than your own. Thinking before action becomes more natural, and slowing down a bit to do so doesn't concern you. Your sense of "I am what I do." is influenced by your wings of "desire to help others," and "appreciation of the aesthetic and beautiful." You can read on about the rest of the Types, or ask yourself: "
Okay, now that I know my Type, what's in it for me?" Core Four: Why do they have it better? Where’s the beauty and art? Five Wing: Leave me alone to think. 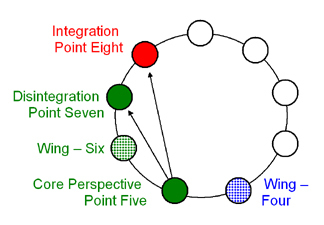 Integration Point One: It can be better, improved; and should be. Disintegration Point Two: How can I help you? Having a deep connection with aesthetic and emotional issues, you can be sensitive, withdrawn, individualistic, artistic, and expressive Your sense of identity feels a deep pull toward: beauty, music, etc. and you may have little tolerance for any lack of emotional authenticity. Your "appreciation of the aesthetic and beautiful" is influenced by your wings of "desire to help others," and "deep cerebral analysis." Focus of Attention: What’s missing in the present? "If only..."
You have an ability to immerse yourself, and even be comfortable, with grief, death, and depression; where others are less capable of "staying with it." Often blessed with a strong sense of the dramatic and/or aesthetic, you want your contributions in life to be unique. You can feel a nagging sense that you deserve more, and others have it easier. The Dark Side: You crave emotional intensity and connection. Highs and lows, and a tendency toward dramatic presentation/affect can be perceived as "too much" for some, perhaps alienating them. Creating drama and over-analyzing it can become almost a bad habit. Attraction to melancholy and the "darker"; emotions can seem like wallowing to others. At its worst, melancholy can slide into depression. Being insistent about exhibiting uniqueness or difference (perhaps showing up as rebelliousness) can be counterproductive to your own goals and off-putting to others. When Stressed Out: You become more of a people-pleaser, reassuring yourself that you haven’t alienated others. Sometimes you become angry about things being done wrong or being wronged yourself. When Relaxed and Secure: You feel much less self-conscious of (or self-absorbed with) your feelings, and more in tune with objective principles. You really enjoy doing things precisely and right. You're okay with less analysis and more action. "Okay, now that I know my Type, what's in it for me?" Core Five: Leave me alone to think. Four Wing: Why do they have it better? Where’s the beauty and art? Six Wing: I don’t believe you. I don’t trust anything. 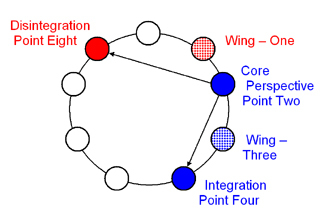 Integration Point Eight: My way really is best. Disintegration Point Seven: Let’s experience everything enthusiastically! Having a cerebral, perceptive, and what others perceive as a "scientific" worldview, you have a natural ability to detach from feelings, needs, and other people. You strive for clarity and a cool head prevailing in situations where others are emotional or succumbing to chaos. Privacy is very important to you, and many of your issues with people are really about boundaries. Generally, human interaction seems to range between unimportant and troubling. Your "deep cerebral analysis." is influenced by your wings of "appreciation of the aesthetic and beautiful" and "seeing what could go wrong." Focus of Attention: Detached for the situation, step back and analyze. You are independent, self-contained, and enjoy delving deeply into areas of knowledge that excite you. You have a highly developed capacity for analyzing and synthesizing complex information. The Dark Side: Your approach can be overly thinking when a more feeling approach is appropriate. You can appear distant, withholding or emotionally unavailable to others, preferring the "safety of" mental realms to interaction. Concentration on your cerebral side may result in ignoring your physical or emotional needs. Your strong need for privacy can extend to isolation and compartmentalization of life: compartments for work, relationship, and leisure; each with their own boundaries of time and place. When Stressed Out: You feel more scattered, impulsive and less grounded. You might suddenly want to escape the sense of stress by connecting socially, or engaging in other "extroverted" activities, which you are not really all that comfortable doing. When Relaxed and Secure: You feel exceptionally grounded, confident, and in charge. You feel that your knowledge can direct you to act and lead others well, and that you belong in this leadership role. You may feel much more connected to your body, and its needs. Core Six: I don’t believe you. I don’t trust anything. Seven Wing: Let’s experience everything enthusiastically! 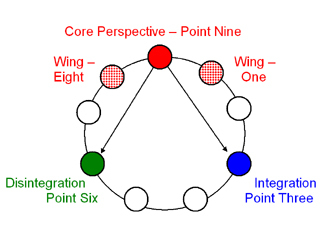 Integration Point Nine: We can all just get along and feel good. Disintegration Point Three: Just do the work; head down and get thru it. Having a Safety/Security-oriented mind, you easily see the pitfalls, downside, or dangers of any situation. This can make you a masterful planner, as you visualize ways to deal with or avoid these dangers. You can be quite engaging and responsible, all the while doubting, and perhaps doing a bit of testing. Your "seeing what could go wrong." is influenced by your wings of "deep cerebral analysis" and "brainstorming/planning." Focus of Attention: What could go wrong, worst-case scenarios, and problem-solving. Your problem-solving nature and ability to see what could go wrong may lead you into your career (many engineers are this Type). Being contrary is one of your ever-ready testing methods, as trust is an issue. Once trust is established, You can exhibit tremendous loyalty to a cause or person you believe in. The Dark Side: If you tend toward the counter-phobic worldview, you may find that you put yourself in harm's way, testing your own ability to face fear; jumping out of airplanes or other adventures. The majority will tend toward having a highly developed sense of danger that can be activated when the actual threat is low. Other people may feel that you are a naysayer or an excessive worrier. Your habit of testing people, combined with equating being "right" with being "safe," can brand you as argumentative with others. Questioning and second-guessing can extend to your own ideas or work, where you can become your own obstacle. Using thinking over intuition, loyalty can be misplaced and reinforce your sense of betrayal. When Stressed Out: You tend to shut down, and maybe bury yourself in your work, without slowing for questions. Very auto-pilot. You sometimes feel more competitive, as if there's an underlying belief that everyone is trying to take you off task or obstruct you. When Relaxed and Secure: All of your questions feel less pressing. You feel more peaceful, open to others, and the here and now. You can actually enjoy yourself "vegging out" and not necessarily doing anything specific. The pressure to build foundation or a sense of security lifts, and you can relax in just Being. Core Seven: Let’s experience everything enthusiastically! Six Wing: I don’t believe you, I don’t trust anything. Eight Wing: My way or the highway. Integration Point Five: Vipassana is next to Godliness. 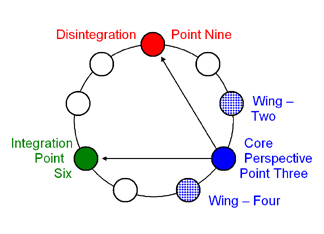 Disintegration Point One: It can be better, improved; and should be. Having a fun-loving, enthusiastic, approach to life, you love to sweep others up in your enthusiasm. You enjoy envisioning possibilities and options, and can feel physically trapped by limitations of choices. Your "brainstorming/planning" is influenced by your wings of "seeing what could go wrong" and "my way or the highway." Focus of Attention: Planning the next fun, interesting thing to do, you can see the bright side of any situation. High energy and upbeat, your enthusiasm is your strongest suit. You are a great idea person, spinning out endless visions and potentials, and a synergistic thinker, making connections between seemingly unrelated things. The Dark Side: Your focus on the bright side of life can lead to neglecting other realms of experience. Sadness, pain, loss or difficulty is avoided. You want to rush to the next experience or sensation in child-like fashion, but may not follow through to completion. You may experience yourself as having an inability to stay focused. Under the joy and enthusiasm, there is a fear lurking. This fear that what you love will be taken away or that you will be abandoned, fuels the outward "requirement" that others share your enthusiasm and joy. When Stressed Out: You feel more need for order, people doing things wrong really tries your patience, and it seems like everyone is suddenly doing everything wrong. You want to think the best of them, but they get on your last nerve. Highly critical and far more controlling. Difficult to see options. When Relaxed and Secure: You feel quieter, slower, easier, and more interested in going deeper into experiences. You don’t feel a drive to chase happiness. Core Eight: My way or the highway. 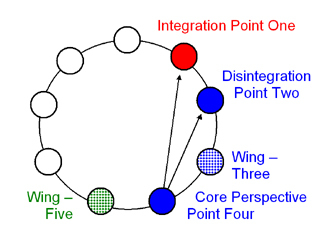 Integration Point Two: How can I can help you? Disintegration Point Five: Leave me alone; I need to think. Having a powerful, assertive, self-confident, and decisive nature, you are a straight-forward, direct, what-you-see-is-what-you-get person of action. You take charge and make decisions quickly. You prefer directness, and although others may see you as confrontational, you'd rather they didn't put you in that position. Your "my way or the highway" is influenced by your wings of "brainstorming/planning" and "why can't we all just get along?" Focus of Attention: Strength of will, power, and getting what you want. You can inspire others to do more than they thought possible by sheer force of will. You often act as protector of the weak and promoter of justice. You may see confrontation as just another way to connect, (if you see it at all) and it’s nice to have something to push back against. Below the surface is a deep wish that you didn't have to confront, and feeling the need to do so adds to your frustration and anger. The Dark Side: Your direct, no-nonsense approach can be perceived as brutal and controlling to others. Unaware of your impact, you can potentially be a steamroller. Decisions made quickly by gut instinct may not be as thought out or feelings-tempered. Your lust for life may lead to excesses. Others can see you as too much, too loud, too everything. You may have no idea why some people can seem to be scared of you. When Stressed Out: You feel more reclusive and emotionally withdrawn, wanting to get away and get space to strategize and better assess before acting. You may want to retract from the "pain" of interactions, to the "safety" of your own mind. When Relaxed and Secure: You feel warm and compassionate, and genuinely want to help, protect, and uplift others. Being nurturing or being nurtured doesn’t feel like weakness to you now. 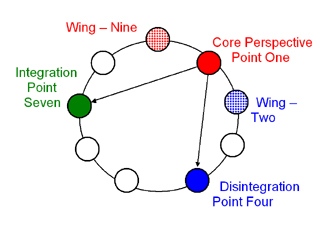 Core Nine: Can’t we all just get along and not have to do anything? Integration Point Three: I can just do it. Disintegration Point Six: I don’t believe you. I don’t trust anything. Having an easy-going, calm, receptive, and generally optimistic approach, you avoid conflict and confrontation, preferring to maintain that peaceful state. You have an intuitive under-standing of other’s internal states to where they can feel as if they might be your own, creating a sense of not being sure. Attention being on others seems to reduce conflict, so it becomes a cycle of comfort Your "why can't we all just get along?" is influenced by your wings of "my way or the highway" and your sense of "rightness." Focus of Attention: Other people’s agenda, positions, and needs. At your best, you’re open and accepting of others without judgment, and you’re capable of deep connection with them. Through your understanding comes an ability to see all sides of an issue and play peacemaker. You value being (vs. doing) and often live in the present moment. The Dark Side: Submerging your own preferences to the agendas and priorities of others leaves you with unmet needs. How you deal with that varies according to your developmental altitude (the most common unconscious strategy is to forget about these needs.) Prioritizing is quite difficult. Seeing all things as equal, and identifying with all parts, can hamper decision making. Your desire for peace can move you to avoid conflict that may be necessary. You may sometimes appear low energy or sluggish to others. When Stressed Out: You feel more anxious, reactive, and nervous. Your ambivalence in decision-making becomes more like second-guessing.